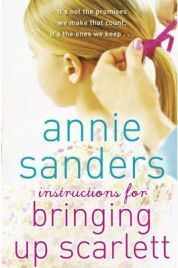 ‘Instructions for Bringing up Scarlett‘ is the latest book from Annie Sanders, who is in fact two people – Annie Ashworth and Meg Sanders – who write together very successfully. In this book, a young girl is tragically orphaned when her parents are killed in a car accident and it is left to her mum’s best friend, Alice Mclean to bring her up as she is now the legal guardian. With a successful career, an enjoyable single life and no real experience of children, this is a daunting task for Alice. Somehow though, she and Scarlett need to find a way to muddle through and carve out a life together. ‘Instructions for Bringing up Scarlett‘ tells the wonderful story of how this happens, and is at times painful but rewarding for both of them. The storyline is in many ways similar to Dorothy Koomson’s ‘My Best Friend’s Girl’ and Rowan Coleman’s ‘The Accidental Mother’ but in other ways it is also very different so don’t think that it is more of the same.